What does Obama's pattern of promoting terrorist goals tell us about his ideology and mindset? 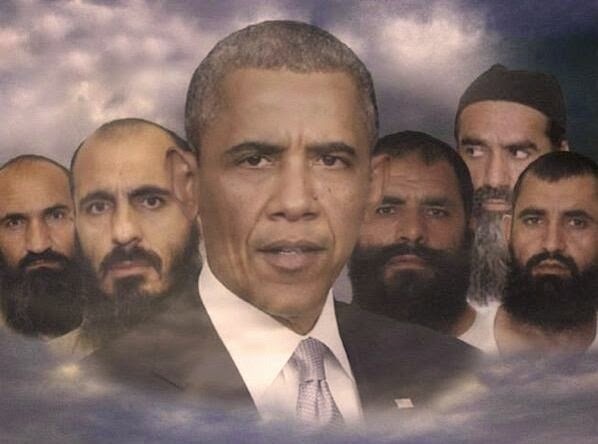 President Obama thought trading a deserter for five top terrorists would be a PR coup. What does this tell us about our president as a person? At the most basic level, it shows that Obama does not share Americans’ visceral reaction to Bergdahl’s betrayal of his fellow soldiers and country. Obama, and no doubt Kerry, thought a deserter could be palmed off as a perfectly fine hero. Before rushing on to the usual chatter about Obama’s incompetence, his wanting to get attention off the VA, and his grandiose belief in his brilliance at negotiating with Islamist regimes, it is important to pause and consider why Obama’s gut reaction is so off. Obama didn’t have a normal visceral reaction to the 9/11 attack in Benghazi, either. Any normal person would have rushed to his post in the Situation Room to oversee a rescue attempt. On that one, Obama skipped the Situation Room entirely, and the rescue attempt, and went to bed to get his beauty sleep for a Vegas fundraiser. Something is off. Obama does not have a normal visceral reaction to Iran’s mullahs armed with nuclear weapons. Just as the economic sanctions on Iran were beginning to bite, Obama lifted them entirely, restored Iran's frozen assets, left their nuclear weapons program intact, and told Israel there will be “negative consequences” if they take out Iran’s nuclear facilities. He is obviously comfortable with a nuclear Iran. That is strange. Obama does not have normal visceral reactions to jihadi groups. Our president worked to install terrorists in power in Egypt, where they had been successfully suppressed for sixty years. He helped depose our ally Mubarak and did his best to hand over Egypt to the Muslim Brothers, a Nazi-jihadi group dedicated to sharia law, the worldwide caliphate, and killing all the Jews on the planet. Obama is still punishing Egypt for rising up and getting rid of the Brothers, by withholding military aid. This is not appeasement; it is not even collaboration – it is working for your enemy’s cause. Barack Obama doesn’t have a normal reaction to the Palestinians, who are busy lobbing 8,000 missiles into Israel from Gaza – murdering, maiming and terrifying men, women, and children. Our president has once again chosen to flout American law, which bans aid to Hamas, and announced we will be funding Hamas as part of a “unity” government. Obama does not recoil at Arab villagers sneaking into Jewish homes to bash a baby’s head against the wall. President Obama understands and sympathizes with the Islamic cause. He is proud of that. He thinks the Arabs are the aggrieved party, and that the Israelis should “walk a mile in Palestinians’shoes.” Obama’s gut check on the Israelis and the Palestinians is off. Obama wants the terrorists to win. He mistakes them for a civil rights group. He is not unique in this, which is why the left-wing media are happy to cover for him and promote his anti-American policies as normal politics. The left wing of the Democratic Party, including Hillary Clinton, doesn’t believe that Islamists are implacable enemies. There is no violent, organized, widespread supremacist Islamic movement based on the mainstream teachings of Islam. The problem is America and Israel. We are too successful, too powerful, too white, and too Western for the left’s taste. Frustrated Muslims are justified in wanting to kill Americans and Israelis. It is we who need to change our ways. His progressive base applauds Obama as community organizer to the world, fighting for social justice for the poor, angry Muslims who only hate and kill because they are mistreated by colonialists and bullying cowboys. To leftists like our president, we are the bad guys. Sharia law is a right. Israeli’s self-defense and sovereignty are wrongs. Islam is a beautiful religion; Judaism and Christianity are backward and hateful. Islamophobia is real. The jihadi threat is not real. Steven Emerson, head of The Investigative Project on Terrorism, lists numerous cases of jihad in America, including the mass murders by Army Major Hasan and the Boston Marathon bombing, where he believes Obama’s pro-jihadi homeland security policies hobbled the FBI from successful pre-emptive action. The Obama administration has invited Muslim Brotherhood front groups, CAIR and others, to control FBI counter-terrorism training. The FBI has been forced to never mention the term Islamic extremist. The FBI is not allowed to describe the Koran as the teachings of Mohammed – it is the revealed word of God. The Obama administration won’t allow the FBI to mention young Middle Eastern males. The FBI is not allowed to link al-Qaeda to the first World Trade Center and Khobar Tower bombings. Calling this political correctness is to trivialize it. If these policies were limited to discussions in the faculty lounge, they could be called political correctness. When our president hands power over our homeland security to jihadi groups, it is collaboration with the enemy. Obama has a pattern of promoting terrorist goals. Obama knows his approach, if honestly reported to the public, would be hugely unpopular. That is why he does it secretly and relies on his Democrat lapdog Congress and media to back him up. Until Bergdahl, they covered successfully for him every time. Perhaps Obama really does think Bergdahl served with honor. Obama himself has carved out a gray zone with the jihadis, partaking equally of capitulation and treason. The Obama Doctrine: enable jihadis to dominate the West. Obama Plans to Cut the Military to Level of 1940. Come Again?